Tmonews is reporting that T-Mobile, the carrier of the people, will soon be bringing back the holy grail of unlimited data plans. It's the real deal, folks. No speed limits, caps, overages, throttling or anything—just an unlimited amount of data for you to use every month, as it should be. T-Mobile will be re-joining Sprint, who has long been the only big carrier to offer unlimited data, as the two carriers to offer affordable unlimited data plans. 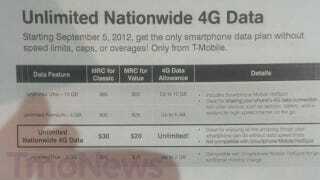 The new unlimited data plan will be $30 for Classic Plan customers and $20 for Value Plan customers. Is it too early to hope that this will trickle into an unlimited data revival for AT&T and Verizon? Can we transport back to a few years ago where it was always unlimited data? Please?